Chickenfoot started their full summer tour with two sold out shows in the South Shore Room at Harrah's in South Lake Tahoe. Fans from as far away as Europe and beyond flocked to the casino for the festivities, a special place for Foot Soldiers and Redheads alike due to the presence of a Cabo Wabo Cantina in the same building. 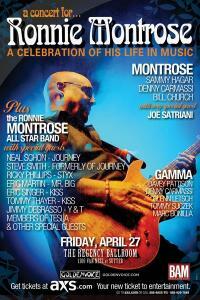 "A Concert For Ronnie Montrose - A Celebration of His Life In Music" will feature the original Montrose lineup (Sammy Hagar, vocals; Bill Church, bass; and Denny Carmassi, drums), performing the landmark first Montrose album, with special guest Joe Satriani on lead guitar. The original Gamma lineup (Davey Pattison, vocals; Glenn Letsch, bass; Denny Carmassi, drums) will also be on hand, with special guest Marc Bonilla on lead guitar. There will also be an All-Star band, composed of many of the great musicians that Ronnie played with over the years. Sammy and Michael featured in Elvis exhibit at Graceland! We were sorry to hear of Ronnie Montrose's passing yesterday. Fan Club Meet & Greet Contest! 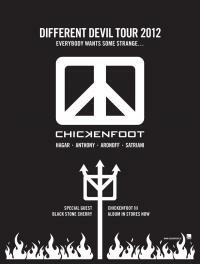 Fan Club members who mark "I'm Going" on CHICKENFOOT.US/tour for one of the DIFFERENT DEVIL 2012 shows will be eligible for an upgrade in to the meet and greet each night. We'll draw one random winner for each show and notify you within 48 hours of your show. Each winner will be allowed to bring one (1) guest to participate in the meet and greet. Be sure to RSVP and let us know which show you're attending! NOTE: Fan Club members must already have a ticket to attend the show; the meet and greet upgrade does not include entry to the event. Ticket presales for both regular tickets and VIP Ticket Packages are starting this week on Tuesday February 28th and we want to make sure you are prepared by answering common questions before you can ask them! Most important: To get access to the presales you will need the codes. And to get the codes, you will need to be a paid member in good standing of the Chickenfoot Fan Club. Click here for details. If you click the "PROFILE" link at the top right of the page (to the right of the "Contact" navigation link), you can confirm your membership status, which must be either "Foot Soldier Standard" or "Foot Solder Premium" to have a presale code. If you have other tech support questions about the fan club or the presales, check out the contact info in the Frequently Asked Questions. (5) For VIP ticket package presales, the password will be display on the tour page. Make sure you are logged into your CHICKENFOOT.US account - otherwise you will not see any codes! Tour dates announced with fan club presales starting next week! Check the tour page for more details - there is also still time to pick up your Fanclub membership before presales start. check out and share this fantastic live performance of "Down the Drain" from the Electric Hall in Germany last week! thanks for an amazing Europe Road Test set of dates! also included is bonus backstage and interview videos and a photo gallery from the show! Hi everyone -- as with many rock'n'roll bands, Chickenfoot has its share of crazy awesome fans who travel all around the country to see the shows (you know who you are and you rule!). Well, in the past few months it's come to our attention that one particular fan has really gone the extra mile (literally!) and made it to all of the US ROAD TEST shows. Not only that, but he was able to build a bit of a friendship with the crew and band so we invited him along to the EUROPE ROAD TEST shows to see if he could share a little inside view to being on the road. 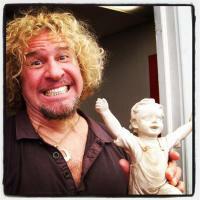 Kenny is going to get pulled in as well and we'll see if we can grab Sammy at some point too! Visit their Google+ pages to post your questions to get invited to the hangouts and also just watch as a viewer. We're using the new "On Air" features of Hangout so even if you don't get to ask your question, you can still watch and comment! Note: Rock'n'roll time may apply but we'll try to hit that time.